Nerdtour 2012 quickie: Artistic Tokyo Station – Nerdwatch! « Lady Gaga, Japanese style! So, I thought I’d try to be a little artistic with another one of my photos from Japan. I see all kinds of “art” photos where the photographer uses grainy black and white, so I thought I’d do the same with one of my more-or-less “artistic” photos, converting the nice clean crisp color photo to this B&W thing. 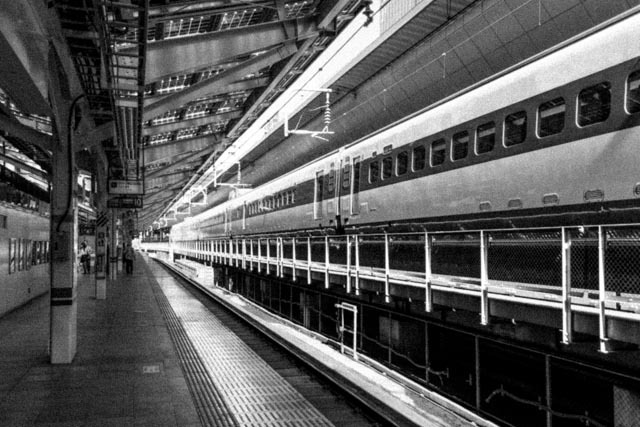 This is a shot of one of the platforms at Tokyo Station. I was headed to Yokohama for the day, and it was well past rush hour so there was hardly a person there. “Crowded Tokyo” is very selective in its appearance. Tagged Japan, Japan Trip, nerdtour, Nerdtour 2012, photography, Tokyo, Tokyo Station. Bookmark the permalink.